Chives are associated with summer in my life. They remind me of my childhood where I spent countless weekends in the gardens of my grandparents, aunts and uncles. We would be eating fruit straight from the bush or tree. I could eat overripe gooseberries or plums until I had tummy aches. We would harvest green beans or carrots, pull weeds or just water plants. We would have BBQs with the greater family. Inevitably, in one corner of the garden, chives would grow with their purple flowers and the distinctive flavor: garlicky. Or peppery. Or both. I had a strong craving for chives recently. Must be the time of the year. Chives have to be eaten raw, or just added to a dish right at the end. I didn't want to mask the flavor with lots of other ingredients. Chives had to be the star. It cannot get much simpler than this: some onions and garlic fried in butter and seasoned with nutritional yeast (which has a slight cheesy and nutty taste), when the chopped chives can be added. 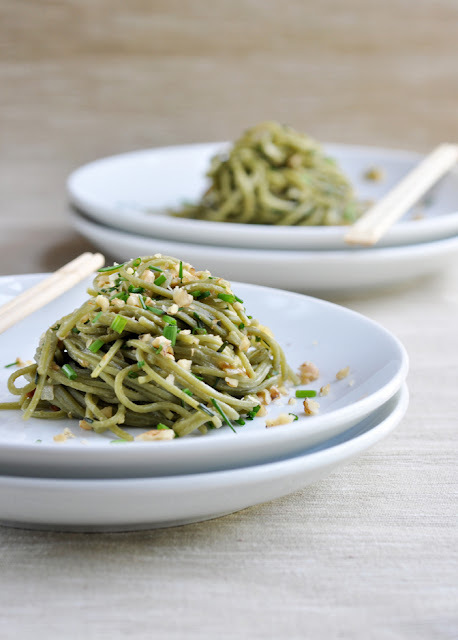 Toss in some soba noodles and sprinkle with chopped roasted walnuts. It will be one of the fastest dinners or lunches you can make, as it doesn't take more than 10 minutes from start to finish. Enjoy. Cook soba noodles according to instructions. In the meantime, melt 1 tablespoon of butter in a small pan over low heat. Add chopped onion and fry until softened, 2-3 minutes. Add garlic and chives and cook for another 1-2 minutes. Stir in the nutritional yeast and season with salt. Add the remaining butter and take off the heat as soon as it is melted. Drain the soba noodles and add them to the chives sauce in the skillet. Toss gently to combine and sprinkle with chopped walnuts. Transfer to serving plates. Serve immediately.